AI Has its home in the (art)n gallery, located in the 847 W. Jackson Ave SAIC G2 building, by Greektown, in Chicago. The floors are wooden and warm, the lighting low. 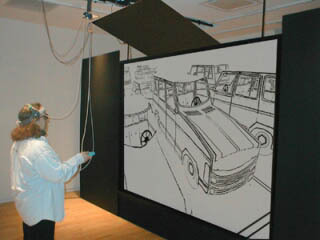 Along three of the gallery walls hang (art)n's PHSColograms--large, backlit light boxes with auto-stereoscopic images within them. 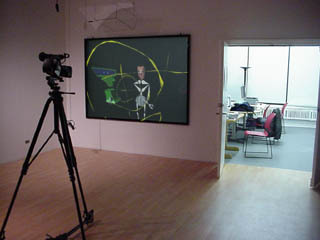 Mounted within the forth wall is a projection screen and a door. 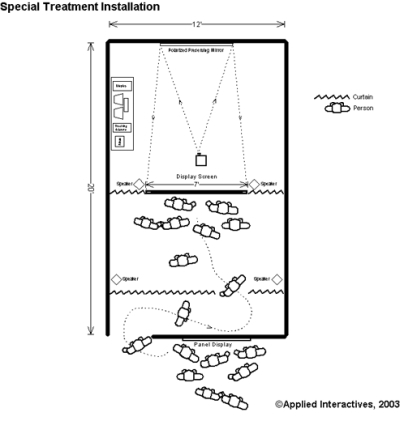 This is the public face of Applied Interactives. Walk through the doorway, and you come into our lab, with a few desks, a conference table, and white walls covered in architectural schematics for Auschwitz and Birkenau. You will probably find one of us there--regardless of the time or day--operating in at least three development environments, immersed in code, sound and models. This is where AI resides, and where you can visit and experience "Special Treatment" or several of our other works. 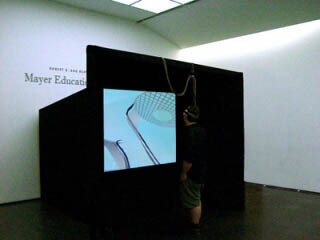 The gallery has an immersive sound system, glasses and tracker, and a wand, for navigation through the virtual environments. "Special Treatment" is an installation piece that has limited constraints. To maintain the suspension of disbelief, our space must be dark, free from sunlight, and moderately climate-controlled. To project a large image onto our immersive rear-projection screen, the space must be 12" X 20", with no obstructions such as columns. We also prefer that the physical environment be sectioned off, so that we can put a plasma screen with interactive information on it for visitors to view prior to the virtual experience. And that's it. Everything else can be supplied by AI, including the projectors, the screen, the glasses and tracking equipment, as well as the framework to install everything. Due to the technical nature of our environment, we require up to five days to install the piece, and one day to de-install it.